Usually, when we go on a trip, we only have a couple of days to explore and unwind. This is mostly because we either have limited time or a pretty limited budget. Hence, we have this tendency to want to explore the place on our own and make the most of our time. I, for one, love to do this especially if my husband and I are on vacation by ourselves. Our first visit to Singapore and Hongkong were no different. We pretty much took advantage of their efficient transportation system! We have seen no reason why we should try out the city’s Hop On Hop Off Bus Tours because of this. Roaming around the city, we’ve previously noticed this buses filled with tourists, but never paid it much attention as we were contented with our maps and brochures. It was great to move around the city like most locals do. We spent most of our trip exploring the city on our own and going to some of the recommended touristy spots we usually see on television and on the brochure. Besides, we were pumped up and willing to take that endless walk to go from one destination to another. On our next trip however, we were particularly curious on how this Hop On Hop Off Bus Tours work – never having tried it before. Admittedly, it was more expensive than using the public transport. Price range depends on the location, of course. You may check their websites in advance should you wish to see the cost. 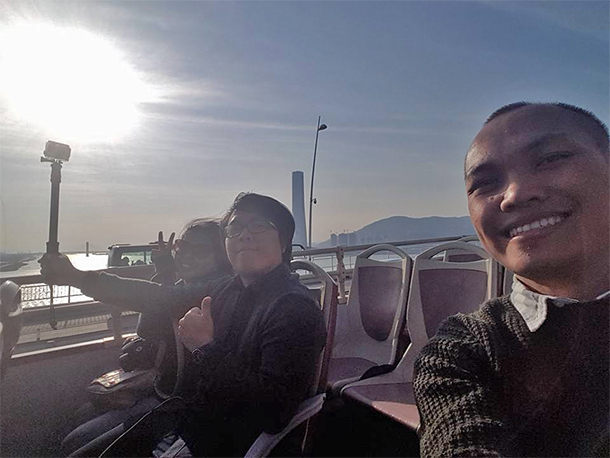 Personally however, I think it was a great way to experience major tourist destinations like Singapore and Hongkong. Also, if you’re going with older people who’d rather sit than walk or you’re with kids, these Hop On Hop Off Bus Tours are lifesavers! In order to avail of the Hop On Hop Off Bus Tours, you must of course, need to purchase the ticket. You may do this online (visit their site) and/ or visit their ticketing offices in the city. For our Singapore and Hongkong trips, we bought our tickets at their ticketing offices. You may check the local brochures found at the airport for the areas where tickets are being sold. 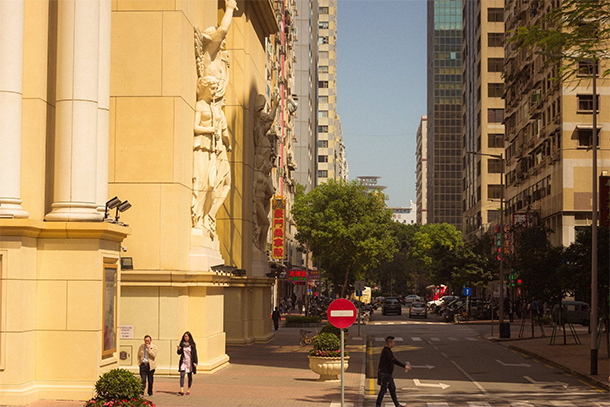 Or you may purchase them directly online, like we did in Macau. We had this problem on our first try in Singapore. We had no maps or brochure from the Bus Tour, thus, there was a bit of confusion on our part. But, we still enjoyed it, nevertheless! Some bus tours operate on a single route while other have multiple routes that you can take. It is important therefore to know beforehand what attractions/ destinations you will pass on the route you will take or avail. Like for example in Hongkong, there were about 3 routes that our Hop On Hop Off Bus Tour usually take. We took all three – though a bit more expensive than the single route. It was still though great since we did get to see more areas in Hongkong than the usual. 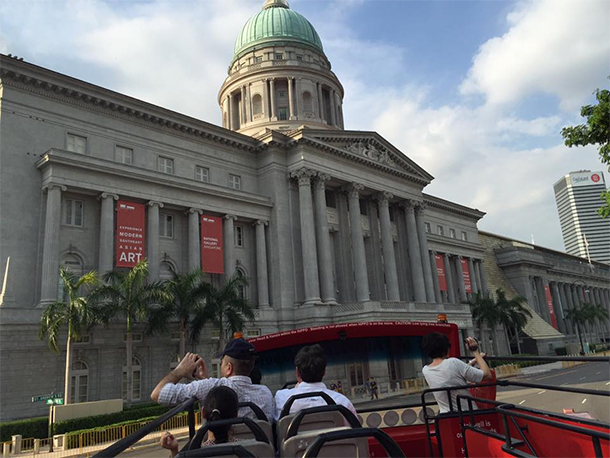 Getting around the city and experiencing it on a Hop On Hop Off Bus Tour is pretty convenient. You just need to know and be familiar with bus stops’ location and the time of interval per bus so as to ensure that you will not miss it. 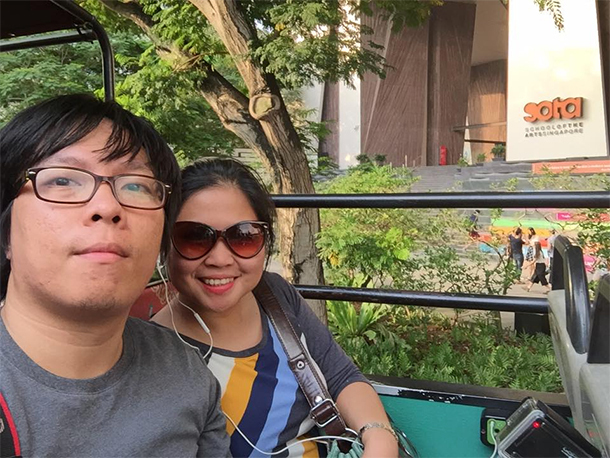 It’s a hassle free way of touring around and seeing the entire city. Bus stops are usually strategically located near popular landmarks and tourist destinations, which gave us the opportunity of seeing it all. And as previously mentioned, if you are with elderly people or with kids, these Hop On Hop Off Bus are lifesavers. It’s a great way to navigate the city without worrying about your companions since you get to comfortably sit while looking at the views. 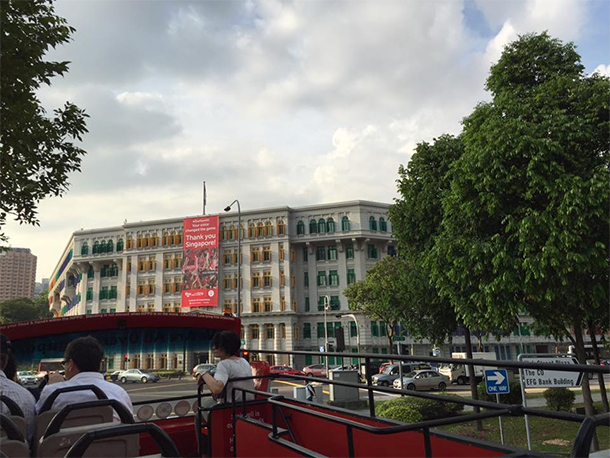 The beauty of riding in a Hop On Hop Off Bus is having the opportunity to see the entire city at above street level. Most bus are double decked, which gave my husband and I a chance to enjoy the view. It also helped us familiarize the city from the bus for easier navigation if and when we wanted to explore it more by foot. Personally, some of my best photos from my trip were onboard the bus! Planning your itinerary will be a lot more easier if you avail the Hop On Hop Off Bus Tours. You can simply get the route map from the ticketing office and then plan your day from there! Hop On Hop Off Bus Tours are Time Savers. We usually book our trip 2-4 days only because I had a full-time job. 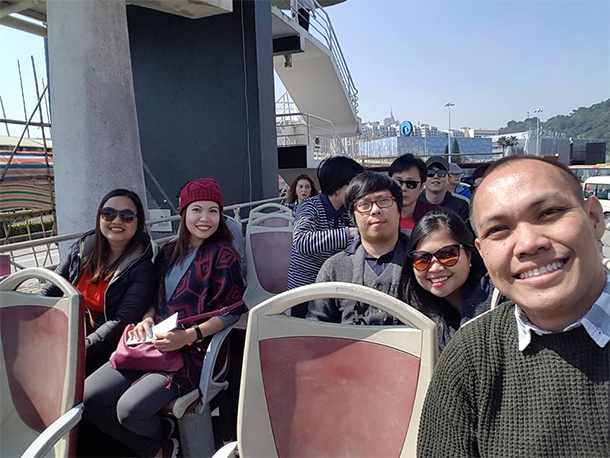 So, getting around and fully experiencing the city through this tours allowed us to save time. We didn’t have to worry about navigating the local transportation. Or finding our way around to go and see the popular landmarks and tourist destinations. We simply had to refer to our maps and just be conscious of the time for the next bus. Hop On Hop Off Bus Tours usually includes a Tour Guide. May it be an actual live person or a recorded audio. 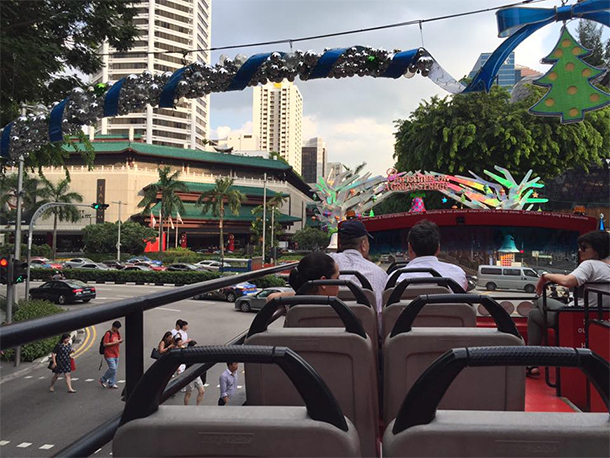 The Sightseeing Bus we availed in Singapore had a pre-recorded audio installed on their buses. 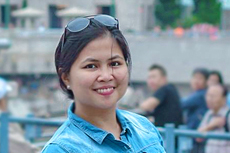 Also for the Big Bus Tours in Hongkong. Headphones were included in the package. You just have to plug it in, select your language and listen to the recorded audio. It is also timely played/ recorded that as you approach a certain place fun facts and trivia about it are played on. The Open-Bus Tour in Macau was different though. They had a tour guide on board who talked to the tourists the entire trip. Explaining away as we navigated through the city. Personally I learned some facts and trivia from the bus tours that I’ve been in. Of course, availing these Hop On Hop Off Bus Tours are totally optional. We did not really considered it before too. But, after availing it, we found these Bus Tours pretty convenient. Especially if you are only going to spend a couple of days in a city. How about you? Have you tried these Bus Tours before or do you prefer to DIY (do it yourself)? Agree that hop on hop off buses are a great way to see a city – we did two fab ones in Miami and Lima and saw a lot more than we would have done trying to get around on our own steam. 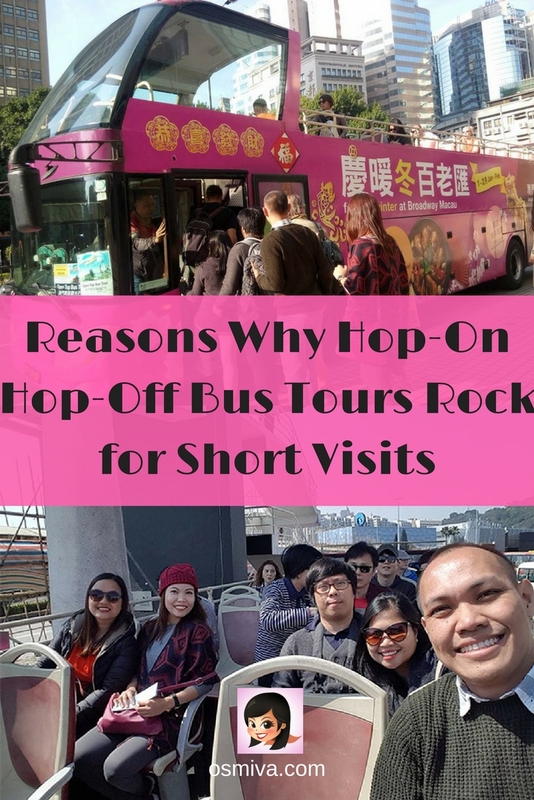 I have never tried a hop on hop off bus tour but want to try it after reading this story! Oooo nice post! My favourite hop-on-hop-off was in Waiheke Island, NZ! The BEST way to see the island and all the vineyards. Hop on hop off buses are very good when you have limited time or if you are traveling solo. I tried the Delhi hop on hop off buses and these are hassle free. I’m actually a big fan of Hop On and Hop Off bus tours! You’re right, they are convenient and you get to see everything in a short amount of time AND for the most part, you get to sit back and relax! Thanks for sharing! I hadn’t thought much about these bus tours either, but they would be especially great as a quick and easy way to see some of the major sights of a city on a long layover. Neat idea for a blog post! I’ve never tried these type of bus tours before either, but you make some excellent points. I hadn’t thought of the better vantage point to take photos. It also makes sense in terms of seeing everything, because they know the best way to get around and can quickly take you to the important sights. I’ll definitely be checking this out for our next vacation. I am such a fan of Hop on & Hop off. I take it in just about every city I travel to. That’s so great to hear! I’m sure you’ve seen so many amazing places through it! I agree with you! I think Hop on Hop Off Buses can be a really efficient way to see a city, especially when short on time or if you haven’t had time to trip plan beforehand. I did one in Budapest last summer and enjoyed it! 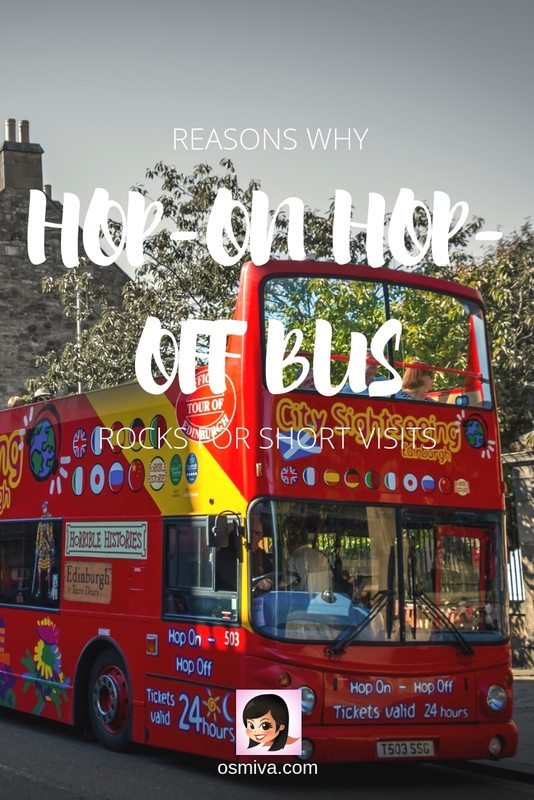 I really like hop-on, hop-off bus tours – they are a great way to get your bearings before exploring on your own. They have also been a lifesaver on days which are either rainy (Lisbon) or too hot (Dubai), as they often have covered sections with air conditioning. They are pricey, but definitely a good way to get to know the main sights! Oh yes, I love these tour for a quick overview of cities! It’s a great thing to do when you have only a few days to explore! I’ve also done one in my hometown and was pleasantly surprised! Hop on hop off helps save time and money whenever we travel and we didn’t hire a private local tour to guide us around places. Taking maps and brochures from tourist information office is also a recommended move we always do. I must admit that I have not utilized hop on hop off buses during my travels but it does seem very convenient. I plan to travel with my grandmother in the fall and this seems like a great idea for our trip. I definitely agree to these hop-on-off bus tours when you are in a place for only a few days. I have joined this type of tour in big cities like New York City and Barcelona and for both times got to see everything they have to offer. Next time I go, I can just visit places that I really like and experience them in more detail. Exactly. There were places we haven’t known before trying out the Bus Tours that we were able to visit and absolutely loved! Awesome post! I love hop on – hop off tours. You get to see so much more than by traveling by bus or subway! Also it is awesome for making new friends! Loved all your tips and tricks! Beautifully put into words ‘ur experience ‘,never had chance but i must do it here in my city(mumbai) as well. Yes, I agree that Hop and hop off tours are great when time in a city with many places is short. I loved the way you have identified the advantages of it. Great Post. Definitely handy with their itineraries though! I wish I did the hop on hop off bus in Cuba. The tour we did wasn’t that great. I totally agree with this. You even get to see parts of the city you don’t even know about. I did one in New Orleans and learned so much. Hop On and Hop Off Bus can really give you more sites at a reasonable cost. It is also easier to navigate. Yes, I do love bus tours because it means not having to wander around aimlessly and waste unnecessary time! wow! never thought of this to be honest. you just gave ma really cool thing to do nexttime i go travel. you’re really a bright dude in here for sharing this idea. cheers! Somehow on my short trips, I never take Hop in Hop off buses. The main reason may be coz I hardly go to touristy places. I usually take the 24-48-72 hrs public transport passes and use Gmaps to guide me!